Setelah kita sempat membahas beberapa legenda pemain sepakbola dunia, merupakan sebuah kehormatan besar bagi saya saat ini untuk memposting pemain yang sangat saya idolakan sepanjang masa, the one and only ... Roberto Baggio !!! Roberto Baggio (born 18 February 1967) is a retired Italian footballer. In his career, he played for Fiorentina, Juventus, AC Milan and Internazionale. In 1993, Baggio won both the Ballon d'Or and the FIFA World Player of the Year. He is the only Italian player ever to score in three World Cups. Baggio is known as Il Divin Codino (The Divine Ponytail), for the hairstyle he wore for most of his career and his Buddhist background. Baggio was born in Caldogno, Veneto. As a youngster, he always had a keen interest in the sport of football and played for a local youth club over a period of nine years. 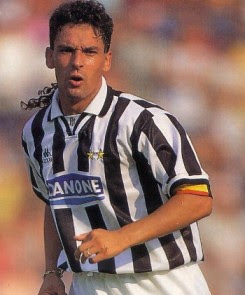 After scoring 6 goals in one game, Baggio was persuaded by scout Antonio Mora to join Vicenza. 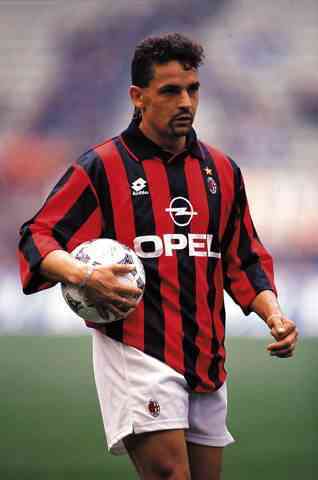 Roberto Baggio is the 6th of 8 brothers. His younger brother, Eddy Baggio, is also a footballer who currently plays with Sangiovannese. Baggio began his professional career at native club Vicenza in Serie C1 during 1982. Fiorentina snapped him up in 1985, and during his years there, he rose to cult status among the team's fans who consider him to be one of their best ever players. He made his Serie A debut on 21 September 1986 against Sampdoria and scored his first league goal on 10 May 1987 against Napoli in a match best remembered for Napoli winning the Scudetto for the first time in their history. In 1990, Baggio was sold to Juventus amid outcry from Fiorentina fans in 1990 for €12 million (US$19 million), the world record transfer for a football player at the time. Following the transfer, there were full scale riots on the streets of Florence where fifty people were injured. Baggio replied to his fans saying: "I was compelled to accept the transfer".The match he played for Juventus against Florence in 1990, he refused to take the penalty; and when substituted out he picked up a Florence Scarf threw into the field by fans and kissed it. He claimed: " Deep in my heart i am always purple." The colour of Florence. In 1993, he won his lone European club trophy, helping Juventus to the UEFA Cup, in the final of which he scored twice. His performances earned him both the European Footballer of the Year and the FIFA World Player of the Year titles. In 1995 Baggio won his first Scudetto with Juventus. This was the first of many league titles to come for Juventus in the 1990s. In 1995, after strong pressure from Milan chairman Silvio Berlusconi, he was sold to the Milanese club. At this time, he had been linked with Manchester United and Blackburn Rovers in the English Premier League, but no firm offers were made from either of these clubs. He helped Milan win the Serie A title, becoming the first player to win the Scudetto in consecutive years with different teams. In 1997, Baggio transferred to Bologna in order to resuscitate his career, and after scoring a personal best 22 goals that year. After the 1998 World Cup, Baggio signed with Internazionale. This proved to be an unfortunate move, as the then coach Marcello Lippi did not favour Baggio. This caused Baggio to lose his place in the national team. In his autobiography, Baggio later declared that Lippi had effectively dumped him after Baggio had refused to point out which Inter's players had expressed negative opinions about the coach. His last contribution to Inter was two goals against Parma in the playoff for the last remaining UEFA Champions League place. After two years with Inter, in order to be called up for the 2002 FIFA World Cup, he transferred to previously unfashionable Brescia. At the start of 2001-02 season, he scored eight goals in the first nine games. Unfortunately, during that season, he tore the anterior cruciate ligament and meniscus in his left knee; despite this severe injury, he came back three games before the end of the season, making a 76 days only recovery. In his first game after comeback, he scored two goals against his former team Fiorentina, the first of them after only two minutes from the start of the match. Then he scored again against another team he played for, Bologna. Baggio continued playing at Brescia until his retirement in 2004. He played his last game on May 16, 2004 at the San Siro against Milan. In the 88th minute, Brescia coach Gianni De Biasi subbed Baggio off so he could get his curtain call. The 80,000 present at the San Siro gave him a standing ovation. He ended his career with 205 goals in Serie A, making him the fifth-highest scorer of all time behind Silvio Piola, Gunnar Nordahl, Giuseppe Meazza and José Altafini. His number 10 jersey was retired by Brescia. He scored his 300th career goal on 16 December 2002 in Brescia's 3-1 home victory over Piacenza. He was the first player in over 50 years to reach this milestone, behind only Piola (364) and Meazza (338). Baggio totalled 27 goals in 56 caps for his national team, the fourth-highest of all time for Italy. He is the only Italian player ever to score in three World Cups, with a total of 9 career World Cup goals which puts him even with Christian Vieri and Paolo Rossi as Italy's top World Cup scorers. For all his talent he was never rewarded with a victory in an international competition. He infamously missed the deciding penalty in the final of the 1994 FIFA World Cup, which contributed to Italy losing the trophy to Brazil. Baggio's first World Cup was the 1990 FIFA World Cup, and although he was used most often as a substitute in the tournament, he was still able to display his quality, scoring twice including the "goal of the tournament" against Czechoslovakia. Baggio is also much remembered for his class; although regularly designated the penalty taker for his team, he stepped aside when Italy was awarded one in the third place match, allowing teammate Salvatore Schillaci to score and capture the Golden Shoe. Baggio was the cornerstone of the Italy team during the 1994 FIFA World Cup, leading them to the final after a disappointing start. He scored five goals, all in the knockout phase, and he started every match from the beginning: two in the round of 16 to beat Nigeria (scoring with 2 minutes left of the game sending it into extra time, and then another goal in extra time), one in the quarter-finals to top Spain (the game winner with 3 minutes remaining) and two to beat Bulgaria in the semi-finals. Baggio was not fully fit for the final against Brazil, which ended 0-0 after extra time; he took Italy's last penalty in the resulting shoot-out, but his kick went over the cross-bar and the Brazilians won the title. Two other Italians, Franco Baresi and Daniele Massaro, had already missed penalties. Baggio finished tied for third in the tournament in goals scored and was named one of the top three players. In Italy's opening match of the 1998 FIFA World Cup, Italy played Chile. Italy's first goal was scored by Christian Vieri on an assist by Baggio. Towards the end of the game a Baggio cross touched a Chilean defender's hand, resulting in a penalty scored by Baggio which made the score 2-2. With this goal, he became the first Italian player to score in three World Cups. In the quarter-final match against France, Baggio came on as a substitute in the second half. The score remained 0-0 and the match went to a penalty shootout won by the host nation. Italy's coach, Cesare Maldini has since been severely criticised for starting Del Piero ahead of Baggio, who was in the better form, for the quarter-final match against France. Cesare Maldini later apologized to Baggio for not giving him the playing time he deserved. Baggio was not called up for Dino Zoff's squad in Euro 2000 and also 2002 FIFA World Cup Korea/Japan as Italy's coach Giovanni Trapattoni considering him not fully recovered from injury. Fans and pundits criticised the omission of Baggio, and Italy were eliminated by South Korea before reaching the quarter-finals, failing to reach expectations. Baggio was given an international send-off match on 28 April 2004 against Spain. He was invited to play for the European XI at the Football for Hope Indian Ocean tsunami relief benefit on 15 February 2005 at the Camp Nou in Barcelona, but he declined the invitation. Baggio wrote an autobiography titled Una porta nel cielo ("A Goal in the Sky", but also "A Gate in the Sky"), including details about his rifts with managers. On 16 October 2002, Roberto Baggio was nominated Goodwill Ambassador of the Food and Agriculture Organization of the United Nations (FAO). On his 40th birthday (February 18, 2007), Baggio started his new website to converse with his fans. As per his website he does not intend to return to mainstream football, but rather exchange words with his fans on his blogs. On October 8, 2008 Baggio appeared in a charity match between Milan and Fiorentina for Stefano Borgonovo, with whom Baggio played at Fiorentina during the late 1980s. perjuangan Baggio di PD 1994 anti klimaks...hero to zero krn gagal penalty...tp tetep dia seoarang legenda hidup & flamboyan !! Ironisnya Baggio adalah penendang terakhir dimana tendangannya sangat menentukan nasib Italia ... Saya pernah baca wawancara Baggio beberapa tahun silam sesaat setelah memutuskan pensiun dimana ketika ditanyakan oleh wartawan pertandingan apa yang akan selalu diingatnya, Baggio menjawab "Final Piala Dunia 1994". Padahal saat itu materi tim Italia ibaratnya "Dream Team" dan layak menjadi juara dunia. di atas itu sosok baggio yang menurut gw "keren"
Setuju ! Dulu Roberto Baggio dijual ke AC Milan konon karena Marcello Lippi lebih senang dengan Alessandro Del Piero. Sebenarnya karir Baggio di Inter Milan lumayan bagus tapi itu sebelum Lippi ditunjuk Massimo Moratti sebagai pelatih Inter. Bisa ditebak selama Lippi menjadi pelatih di Inter, Baggio lebih sering jadi pemain cadangan padahal saat itu kemampuannya masih handal. baggio itu pemain yang luar biasa...mungkin minim hype media...tapi kualitasnya bintang 5 banget...ini penilaian subjektif gw aja..
Roberto Baggio pemain yg luar biasa..
dia pernah membela 3 klub besar di seri a..Juventus,AC Milan, & Inter Milan..
Sepanjang karirnya dihabiskan merumput di seri a ya?? Dulu tahun 1997 sempat tersiar kabar bahwa Roberto Baggio bakal bermain di Sampdoria bersama Juergen Klinsmann dan Roberto Mancini, namun ternyata dia lebih memilih Bologna ... Padahal kalau dia jadi bergabung, bisa dibayangkan betapa dahsyatnya Sampdoria saat itu.